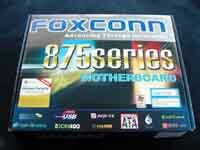 Up for review today is the FoxConn 875 Series (875A02-6EKRS) motherboard based on the Intel 875P+ICH5R Canterwood chipset. 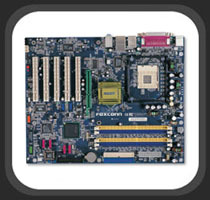 This ATX form factor board supports Intel Pentium 4 and Celeron Socket 478 (Willamette/Northwood/Prescott) processors, up to 4GB of dual channel PC3200 DDR memory, and includes a host of attractive onboard features. FoxConn may not be a household name, but it has been around for some time (see list of milestomes below). Chances are, you’ve already used their products and didn’t even know it! 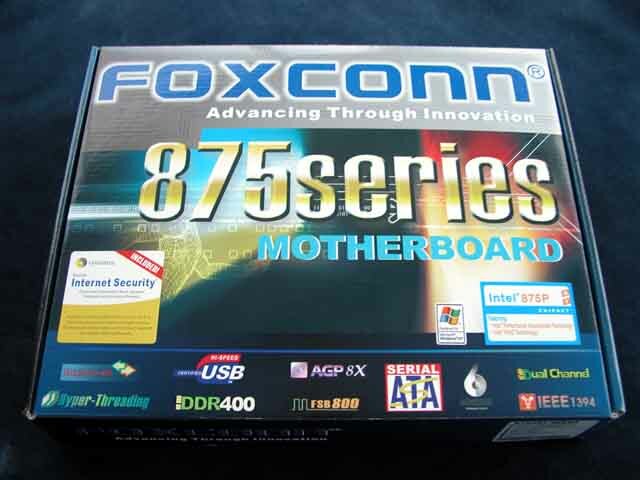 FoxConn is the registered trade name of Hon Hai Precision Industry Co., Ltd., a global leader in providing mechanical and electromechanical solutions to the communications, consumer, and computer industries. The world's largest manufacturer of PC connectors, Hon Hai is also one of the world's leading manufacturers of cable assemblies, desktop PC chassis, and server enclosures. 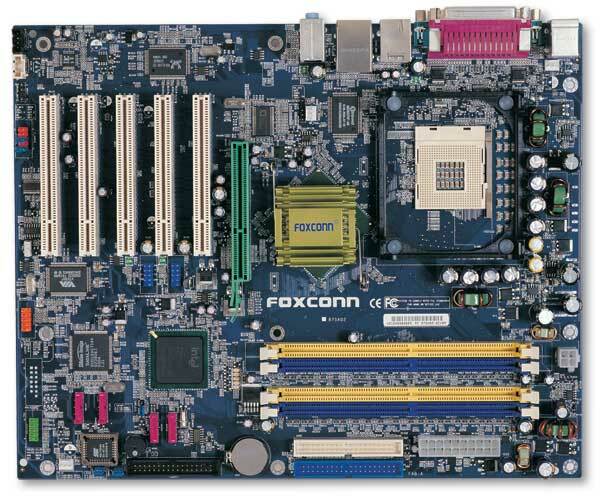 This FoxConn 875 Series motherboard boasts many advanced features like, up to 4GB unbuffered ECC/non ECC PC3200/2700/2100 DDR memory, 800MHz FSB, USB 2.0, AGP 8x, Realtek GbE LAN, and AC’97 v2.2 6 Channel Audio... to name a few. Also on board are 4 S-ATA headers, 2 are controlled by the Silicon Image Sil3112A chip that provides RAID 0 (striping) and RAID 1 (mirroring), the other 2 are controlled by the ICH5R southbridge chip providing RAID 0. Of course, all 4 S-ATA headers can be used as separate channels. 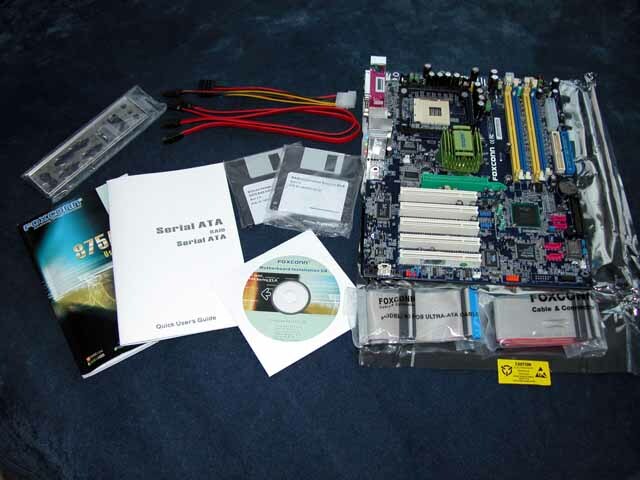 The photo below left shows the box with many of the motherboards features printed on it. The photo on the right shows what comes in the box, the motherboard, motherboard manual , S-ATA RAID manual, drivers CD, 2 floppy RAID driver disks (1 for the Silicon Image RAID & 1 for the Intel ICH5R southbridge RAID), back I/O plate, 2 S-ATA DATA cables, 1 S-ATA power cable (supporting 2 drives), 1 floppy cable and 1 80 wire IDE ribbon cable.